Day three of our CCE; Lemon Crinkle Cookies won the LDS Living Best Cookie Recipe Contest in 2011. If you are baking for a lemon lover, they’ll love this treat. Some people say you either are a chocolate or lemon lover. It’s like choosing which child is your favorite. Always a fun discussion to have with your children. Oh reminder, Christmas is 20 days away! Preheat oven to 350 degrees (I use the convection setting). Grease light colored baking sheets lightly with non-stick cooking spray and set aside. Or use parchment lined baking sheets. In a large bowl, cream butter and sugar together until light and fluffy. Whip in vanilla, egg, lemon zest, and juice. Scrape sides and mix again. Stir in all dry ingredients slowly until just combined, excluding the powdered sugar. Scrape sides of bowl and mix again briefly. Roll a heaping teaspoon of dough (I use a 1 ½ inch cookie scoop) into a ball and roll in powdered sugar. Bake for 8-9 minutes* or until bottoms begin to barely brown and cookies are set. -The original recipe calls for 1 ½ cups all pupose flour. 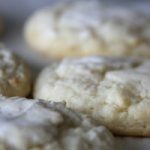 I baked these several times and found the cookies were not as puffy as I would like. We live at about 4400 ft above sea level and have to add additional flour to achieve a cookie that is not completely flat after baking. I tried adding additional all purpose flour, but found using a total of 1 ¾ cups of cake flour produced the result I wanted- a cookie that was still chewy and moist, but not flat. -If you are baking in an oven that is a professional model (Wolf, Viking, etc) made for home use, bake at 325 convection, 6-7 minutes. Very good cookies! I had some cake flour I wanted to use up and stumbled upon this recipe. They we’re a hit at the family Christmas gahthering last year and I’m planning to make a double batch for this year. Hi Alexis, these cookies are perfect for Christmas gatherings. I’m glad you found them and thanks for sharing!